I've been thinking a lot about angel crafts for Christmas this year as it will be the first since my dad passed away. Something about angels is very comforting to me right now and makes me feel like he's watching over me. I love hand and footprint crafts for toddlers as they make such great gifts and keepsakes. I came up with these footprint angels to hang on our refrigerator as a reminder that Grandpa is with us. 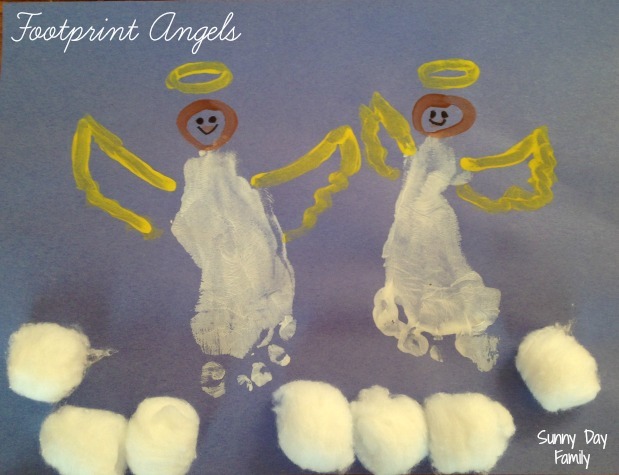 Paint your child's foot with white washable paint and press down onto the construction paper to make your angel body. Paint your angel's head, halo, and wings using brown and yellow paint. I used a marker for the eyes and smile. Be creative! Depending on their age, kids can certainly do this part for themselves. Allow to dry. Then, put some glue on a paper plate. 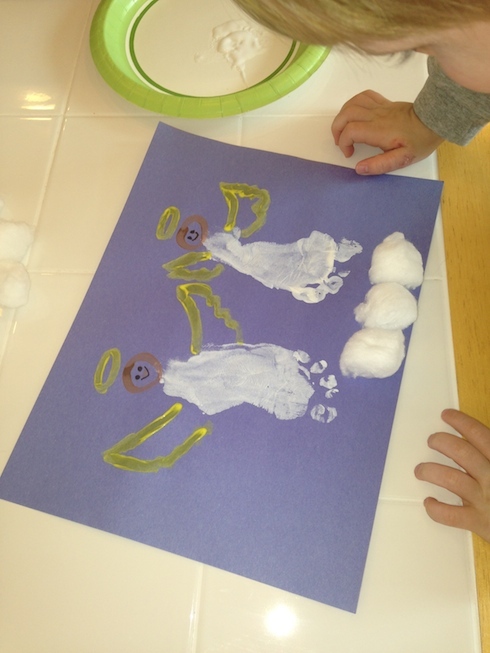 Give your child some cotton balls to dip in the glue and stick onto the paper to make clouds. This was by far the best part for my toddlers. This was a really easy craft to do with my toddlers - making the cotton ball "clouds" let them be creative and add their own special touch. We love our little angels! I think this is what we will be doing to this year!